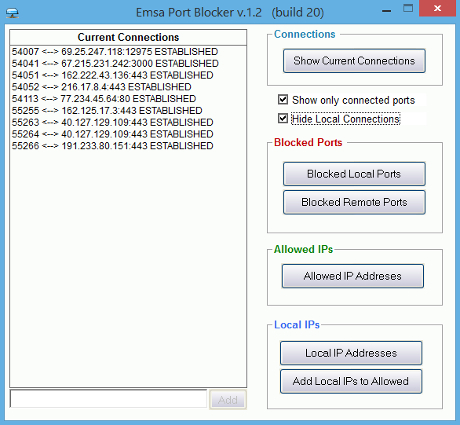 Emsa Port Blocker is a TCP blocking utility. What it does, is blocking unwanted tcp access from/to your computer. It is not a firewall, but works in a similar fashion. Its purpose is to prohibit TCP access on certain ports and ip addresses. IT can also be used as a TCP monitor because it shows TCP connections currently active on the machine. - When first started up, the program shows a list of TCP connections on your machine.If you don't see anything there, try opening browser and visit some site and you'll see them. - By unchecking the 'Show only connected' checkbox the program will also show tcp connections in other states, like LISTENING and so on. - The left hand list is versatile and its meaning depends on the last button clicked - check the label above to see what the list is currently displaying. - To add items to a particular list, type into the textbox below and click on add. Make sure you enter valid data (valid ip addresses/ valid port numbers).To delete one item, select it in the list and click on 'Delete'. - To view Allowed IP Addresses, click on the corresponding button. By default, here you will see your local IP address (127.0.0.1). You may want to add all your local IP addresses to the allowed list. To do that, click on the 'Add local IP's to Allowed' button. Then go to 'Allowed IP Addresses' and you will see them. You may preview which are your local ip addesses by clicking on the 'Local IP Addresses' button. - To block a local port, click on 'Blocked Local Ports' and add one item to the list. For remote ports, same thing, using the 'Blocked Remote Ports' button. All settings take effect immediately and the configuration is also automatically saved in registry. An additional use of this program could be the case when you have to remotely deploy a software firewall on a remote computer. In most cases you can't do that - because what would happen is that the firewall asks for reboot after installation, and then you'll permanently loose connection to the machine. By default,firewalls are set to learning mode, so at the next boot you will no longer be able to acces the machine! So then you will have to ask someone to log into the machine directly and configure or at least disable the firewall so you can get back in. If your need is to block certain TCP ports, our program may be used as a temporary solution until you manage to properly deploy a firewall on the remote machine. Finally, an explanation on how the blocking works with this program. As long as the program runs, it constantly monitors the TCP connection table for changes. This is done each milisecond or so. Whenever a new client has connected, it checkes this against its current rules, and if a blocked port is used, it will immediately send command to the operating system to instantly terminate the connection. As you can see, this program is not a firewall, this giving it some advantage in certain cases, which is that can usually be used on a machine with an existing firewall, if you don't want to reconfigure your firewall and find this tool usable for some purpose. We recommend testing it thoroughly to see if it fits your purpose. Keep the program running and minimized in systray to benefit from port protection. 5. Close and restart Port Blocker. That's it - you're done! Port blocking should run fine now. If the program does not show the connections list OR does not block remote ports, please make the compatibility settings in the "Windows 10 setting" above. This should normally fix the issue. Version 1.2.38: Critical bug fix - Fixed an issue that could cause connections list and port blocking to work intermittently. All customers with older versions and 1.2.38, please upgrade now to the latest version as this is an important fix. Any usual Windows machine with a couple mbytes of free disk space will do.